The 6th grade students at St. Didacus Parish School have taken on quite a task. Their mission is to help the missions, and to teach the other grades at their school about the importance of tithing. For one day, these 6th grade students became the teachers, giving a lesson on God’s message to give to others, helping those in need. Once the students understood this concept, the 6th graders showed them how it relates to Mark 12: 41-44, “The Widow’s Offering.” A poor widow may have given only two pennies to help the church, but Jesus took note that she actually gave more than all that the very wealthy people had donated, simply because she had given almost all of what she had. 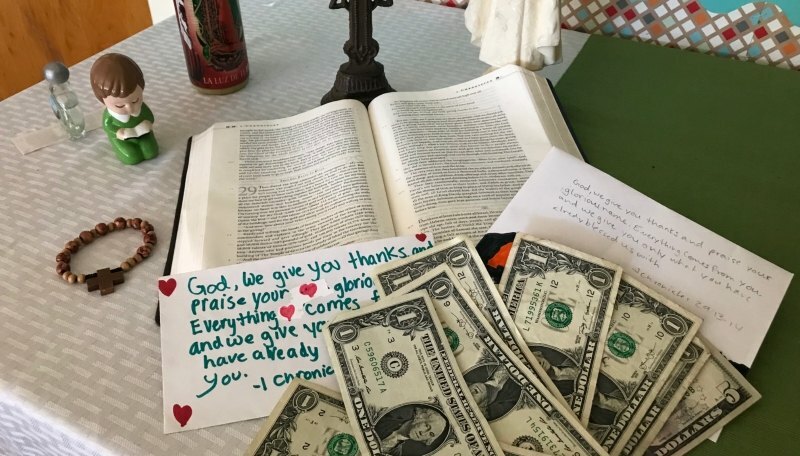 The church doesn’t ask its members to give everything they have, but through tithing, they are able to give enough to notice the value of their gift. With just a short lesson to the school on the value of giving, the St. Didacus 6th Graders made not only a valuable impression on their fellow students, but will also make the children of the Missionary Childhood Association very happy as the recipient of their gifts.